Heart Meridian / Channel Acupuncture Points. -It stores (藏, Pinyin: Cáng), the shén (神, ’Aggregate Soul‘, usually translated as mind). -It governs Xuě (blood) and vessels/meridians. -It opens into the tongue and reflects in facial complexion. This meridian contains 9 acupoints in one side, that is 18 acupoints in total. 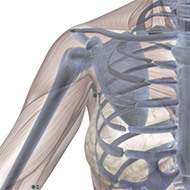 Location: When the upper arm is abducted, the point is in the center of the axilla, on the medial side of the axillary artery. Indications: Pain in the costal and cardiac regions, scrofula, cold pain of the elbow and arm, dryness of the throat. 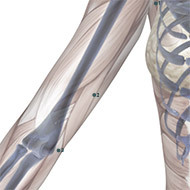 Acupuncture Method: Avoid puncturing the axillary artery. Puncture perpendicularly 0.5-1.0 inch. Moxibustion is applicable. Vasculature: Laterally, the axillary artery. Innervation: The ulnar nerve, median nerve and medial brachial cutaneous nerve. Location: When the elbow is flexed, the point is 3 cun above the medial end of the transverse cubital crease (Shaohai HT-3), in the groove medial to m. biceps brachii. Indications: Pain in the cardiac and hypochondriac regions, shoulder and arm. 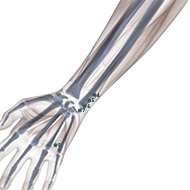 Acupuncture Method: Puncture perpendicularly 0.3-0.5 inch. Moxibustion is applicable. Vasculature: The basilic vein, the superior ulnar collateral artery. Innervation: The medial antebrachial cutaneous nerve, the medial brachial cutaneous nerve and the ulnar nerve. 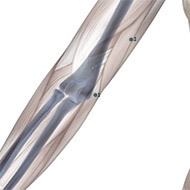 Location: With the elbow flexed, at the midpoint of the line connecting the medial end of the cubital crease and the medial epicondyle of humerus. Indications: Cardiac pain, spasmodic pain and numbness of the hand and arm, tremor of the hand, scrofula, pain in the axilla and hypochondriac region. Vasculature: The basilic vein, the inferior ulnar collateral artery, the ulnar recurrent artery and vein. Innervation: The medial antebrachial cutaneous nerve. Location: When the palm faces upward, the point is on the radial side of the tendon of m. flexor carpi ulnaris, 1.5 cun above the transverse crease of the wrist. Indications: Cardiac pain, spasmodic pain of the elbow and arm, sudden loss of voice. Innervation: The medial antebrachial cutaneous nerve; on the ulnar side, the ulnar nerve. 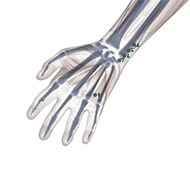 Location: When the palm faces upward, the point is on the radial side of the tendon of m. flexor carpi ulnaris, 1 cun above the transverse crease of the wrist. Indications: Palpitation, dizziness, blurring of vision, sore throat, sudden loss of voice, aphasia with stiffness of the tongue, pain in the wrist and elbow. 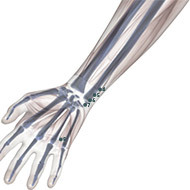 Location: When the palm faces upward, the point is on the radial side of the tendon of m. flexor carpi ulnaris, 0.5 cun above the transverse crease of the wrist. Indications: Cardiac pain, hysteria, night sweating, hemoptysis, epistaxis, sudden loss of voice. Regional anatomy: See Lingdao (HT-4). Location: At the ulnar end of the transverse crease of the wrist, in the depression on the radial side of the tendon of m. flexor carpi ulnaris. Indications: Cardiac pain, irritability, palpitation, hysteria, amnesia, insomnia, mania, epilepsy, dementia, pain in the hypochondriac region, feverish sensation in the palm, yellowish sclera. 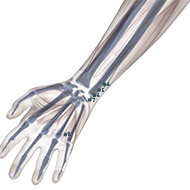 Location: When the palm faces upward, the point is between the 4th and 5th metacarpal bones. When a fist is made, the point is where the tip of the little finger rests. Indications: Palpitation, pain in the chest, spasmodic pain of the little finger, feverish sensation in the palm, enuresis, dysuria, pruritus of the external genitalia. Regional anatomy Vasculature: The common palmar digital artery and vein. Innervation: The fourth common palmar digital nerve derived from the ulnar nerve. Location: On the radial side of the little finger, about 0.1 cun from the corner of the nail. Indications: Palpitation, cardiac pain, pain in the chest and hypochondriac regions, mania, febrile diseases, loss of consciousness. Acupuncture Method: Puncture subcutaneously 0.1 inch, or prick with a three-edged needle to cause bleeding. Moxibustion is applicable. Vasculature: The arterial and venous network formed by the palmar digital proprial artery and vein. 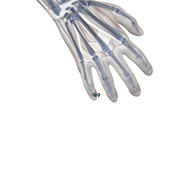 Innervation: The palmar digital proprial nerve derived from the ulnar nerve. This meridian originates from the heart, emerges from and spreads over the heart system, then goes downwards through the diaphragm to link with the small intestine. The branch from the heart system runs alongside the esophagus to join the eye system.